This took a long time to build. I had very poor plans from an old “Popular (something or other)” magazine and as many pictures of the originals I could find on the internet. I even took the time to build a sample out of cheap cedar before I went to the expensive wood. All of the long leg pieces and foot rest and back rest staves were laminated with 1/8” slices up to 2” thick for the legs and 1/2” for the staves. This whole chair folds to only 8” thick. Better than the originals, or so I understand. I changed the folding geometry slightly to achieve this. Made completely from 2 each 10”x2”x10 ’ Sapele boards. I lost a lot of material cutting the 1/8” slats for the laminations. It is still very heavy to fold and move. 3 sets of rotational hinges and 2 sets of brass “sewing machine” hinges complete the build. 3 coats of Waterlox for a finish. Could probably use several more. Once I leveled the legs, it was very stable. Solid as a rock and held even my weight. I was pleased with that. Needless to say, it has not spent a night by the pool as of yet. Maybe someday. The finished product is a fine result of your tenacity and craftsmanship…well done! I have toyed with the idea of a similar Titanic deck chair but would probably need several visits to a therapist before completion. And since I view woodworking as therapy, I have not considered jeopardizing that fragile association…yet anyway. Great job! It would be cool to see it folded up . This is an amazing project! I’ve loved these chairs ever since I saw Norm make one in the 80’s/90’s. Very well done! Do you have plans for sale? Gorgeous work and a gorgeous result. Love the historic significance and nostalgia. Seems appropriate that the project had icebergs to dodge. Very impressive and quality work. This is a beautiful reproduction of a Titanic chair. Nice work. id love to make one myself but just don’t have any use for one unfortunately.you did a killer job on this one,i can only imagine what went in to doing this.beautiful work dave.im giving it a top 3. Beautiful looking chair. I like the curves. This is an amazing project! I ve loved these chairs ever since I saw Norm make one in the 80 s/90 s. Very well done! Do you have plans for sale? Beautiful work with excellent execution. I’d love to see a picture of it in a folded configuration. How heavy is it? A project to be proud of! 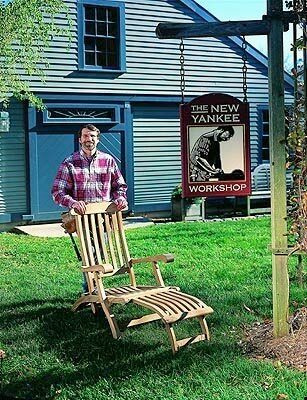 That’s a beautiful deck chair—no wonder it never sits outside overnight!